Local journalism would benefit from more focus on filling in coverage gaps and building strong relationships with readers, according to panelists at the International Symposium on Online Journalism on April 13. 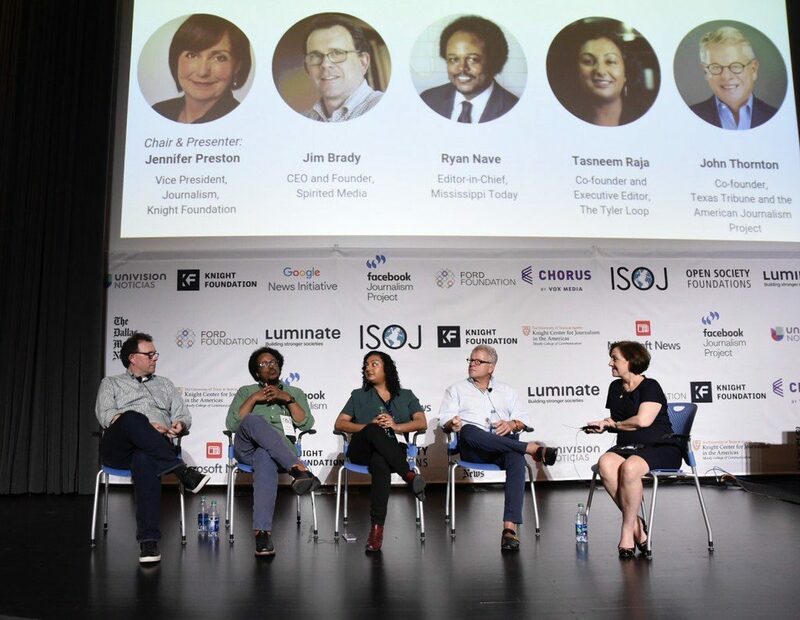 During the panel “Saving local news in the U.S.: Can we have sustainable online journalism in local markets,” industry professionals discussed how local, smaller newsrooms can remain viable in a changing media environment. One way to do so is to produce content that’s vital for the community by filling reporting gaps, said Ryan Nave, editor-in-chief of the nonprofit Mississippi Today. He said his newsroom reports on the ins and outs of the state legislature, including smaller meetings and hearings. This kind of reporting, he said, has had an impact on the newsroom’s audience. “They feel like they get something that they’re not already getting,” Nave said. In addition, the newsroom prioritizes reporting in the community — not just reporting from inside the newsroom. The Tyler Loop does this, too, said Tasneem Raja, co-founder and executive editor of the nonprofit news outlet in Texas. It’s important to get out in the community not only to produce better informed stories but also so the community is familiar with the newsroom’s mission, Raja said. It will help local newsrooms foster better relationships with their readers, she added. “Get up, go to communities and be proactive about your relationship,” Raja said. Getting out of the newsroom and into the community is essential for local newsrooms, said Jim Brady, CEO of Spirited Media which until recently operated local news sites in Philadelphia (Billy Penn), Pittsburgh (The Incline) and Denver (Denverite). He added that it’s important for local journalism to reflect and be part of the community. This will help build loyalty with readers, he said. Another tip he gave for building relationships with readers is to shift away from using page views as the main metric for determining audience engagement. “It’s not a quantity game at the local level,” Brady said. Newsrooms should instead focus more on producing “journalism of value not volume.” He added that his newsroom philosophy centers on producing a few well-reported and well-written articles rather than having several aggregated-style reports. The panelists all said that relationship building is key for the local newsrooms — both in nonprofit and for-profit newsrooms. It’s imperative for community support and funding, they said. Maintaining revenue can be tricky for smaller newsrooms, but there is a potential for growth, especially in the nonprofit space, said John Thornton, a venture capitalist who founded The Texas Tribune and co-founded the American Journalism Project. He pointed to the success of newsrooms like The Texas Tribune. “This is where the growth is — nonprofit newsrooms at the local level particularly,” he said. Despite the changing media environment and the difficulties it can give local newsrooms, all of the panelists were optimistic about the future of local journalism. Panel moderator Jennifer Preston, vice-president of the Knight Foundation, said the local journalism industry is going through transformational change but that it’s also seeing promising signs for the future. And that’s crucial, she added, because of the importance of local journalism. “Journalism is something so vital and important to our democracy,” Preston said.